Sticky Fingers proves, again, that there really isn’t anything that duct tape can’t do. The duct tape wallet was the first popular way to craft with strong tape, but kids and crafters alike have taken the sticky stuff all sorts of places by using it to make fabric for bags and accessories to wear, for the home, and for school. 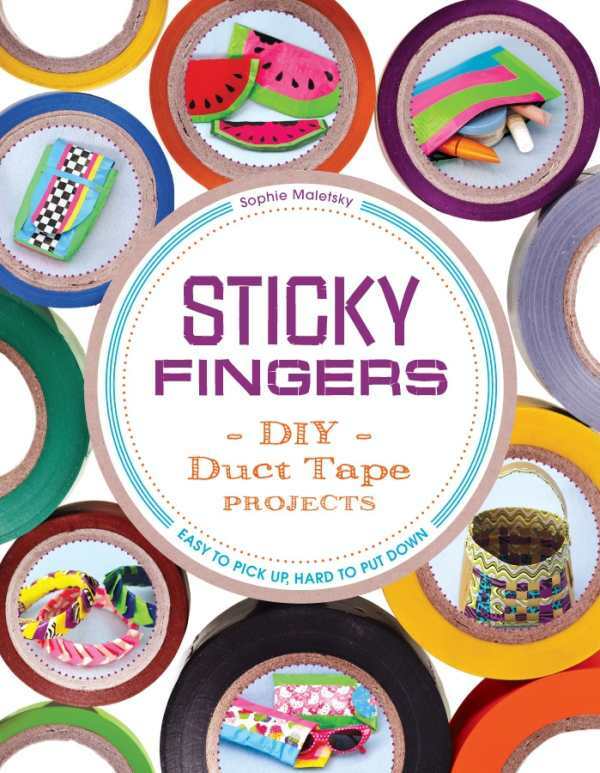 Sophie Maletsky, a crafter and children’s event planner, shows some of the range of projects that can be made with little more than scissors and tape in her book, Sticky Fingers: DIY Duct Tape Projects. This fun, creative, and colorful book takes readers through the whole process of duct tape crafting, including a look at the needed supplies, dos and don’ts for selecting a work surface (because duct tape is very sticky and can damage surfaces), and how to set up a portable work station. The instructions are encouraging, and each project is illustrated with good-sized, step-by-step photos, as well as a skill level indication from one to five and an estimated time for each project, making it ideal for crafters with limited time in one sitting. Maletsky offers a nice variety of projects, and the range of skill levels means even those who’ve never made projects with duct tape before should find something that appeals to them. Photos show the wide range of colors and patterns that are available, which is sure to inspire readers to make their own colorful creations. The book starts with building-block projects, like strips and duct tape fabric, which can be made with tape on both sides or backed with felt or a piece of tarp. Basic pouches with different closures follow to get new crafters comfortable with the process. A chapter at the end of the book offers suggestions for using the last bits at the end of a tape roll and even ways to use the cardboard center. Projects—more than fifty in all—include both basic and detailed bags, wallets, and cases that can be made as shown or personalized and altered. A watermelon purse, for example, could inspire a different kind of fruit, while the money keeper, shown with an earth on the front, could easily sport a different shape. Cases for phones and tablets, a messenger bag, and a fantastic woven beach bag bring these dramatic projects into everyday use. Lots of funky bracelets and rings are presented for people who like a personalized look as well as using leftover bits from other projects. Locker organizers, pencil cases, folders, and other accessories make school more colorful, while organizers, photo frames, and jewelry holders help kids personalize their rooms. These projects are engaging and good for beginners as well as those who might have made the classic wallet before. The book is aimed at younger crafters, but adults who have kids to craft for might enjoy it, too. The fun project ideas and detailed instructions make it easy to get started and help ensure that duct tape crafting is something readers will stick with for a long time.